Why wouldn't I? Everything I need is right on my lappy! I was thinking along the lines of you simply taking clothes and some necessities along, like a retreat sort of deal; otherwise leaving electronics and such at home. I know that I probably would. I don't really see the point of leaving my laptop at home. It's not like I can't just, you know, not use it if I turn out not to really need it, but it's nice to have with me if I want it. I plan on doing more then hanging out in the hotel room for sure, but it's not like I am gonna be running around doing stuff 24/7 either. That would just burn me out and make me tired and grumpy. There is no need to force it. Besides, if you think Singapore is like some nature retreat untouched by man, it really isn't. It's every bit a modern sprawling metropolis as New York City or Tokyo. 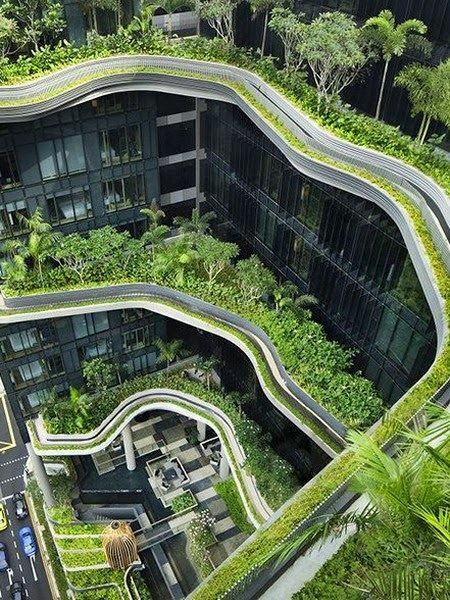 Though I heard they like to make pretty hanging gardens and greenery on the side of buildings in some places, like this! Practically Solarpunk in places I hear. (Blah blah, TVTROPES blah.) That's a design philosophy I can get behind!